I love to solve puzzles, and this quilt is the result of one of those challenges. I found a large bundle of fabrics with similar prints and many different colorways. When the six young quilters were sewing quilts for the Children’s Quilt Project, Alice had chosen some wonderful green Hawaiian print fabric for her project, so when these Hawaiian-style fabrics showed up, I hoped that these would be the perfect fabrics for Alice’s graduation quilt. Cutting these great fabrics into simple squares seemed most prudent, and then the fun of the layout began. Since these fabrics all looked like each other, I was concerned that the quilt would be boring if I used only these fabrics. On the other hand, because they all looked like each other, anything that I put next to them stood out like a sore thumb – – – a classic dilemma. So what do I do for inner and outer borders? The solution came when I started playing with these fabrics on the design wall: the value differences in the prints showed up as light and dark when they were grouped together, and a “natural” border was created by the fabric placement. 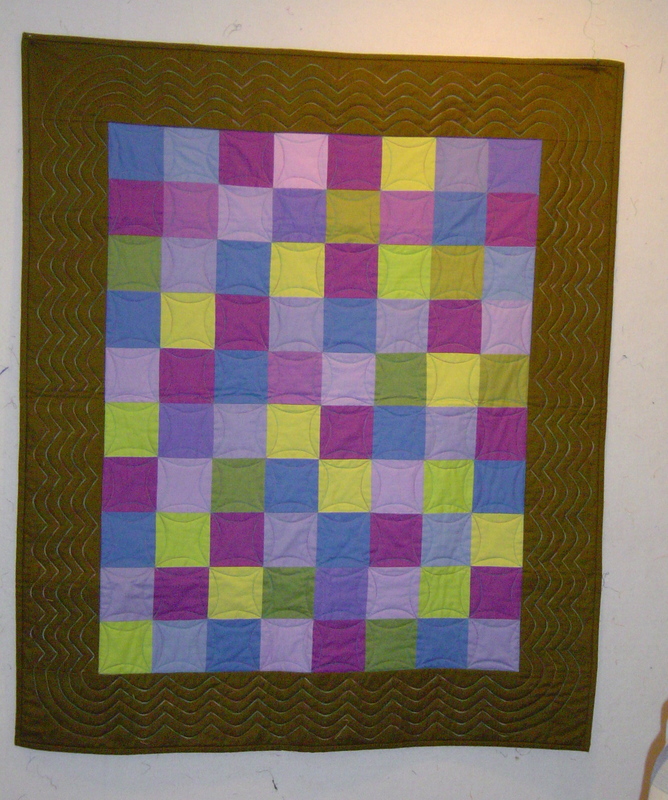 In addition, I had exactly enough squares to complete this quilt as you see it. Puzzle solved ! ! ! EBHQ kit may also include binding strips. Please sew these together, end to end. On a design wall, start by making one long “fence”, and then add to either side of it using a fabric that contrasts with the first. If you don’t have enough of one fabric to complete the “fence’, use another, similar or not. Almost anything works. The kit may include extra pieces, and if you don’t like some of the fabrics, feel free to use some from your stash to make this quilt your own. 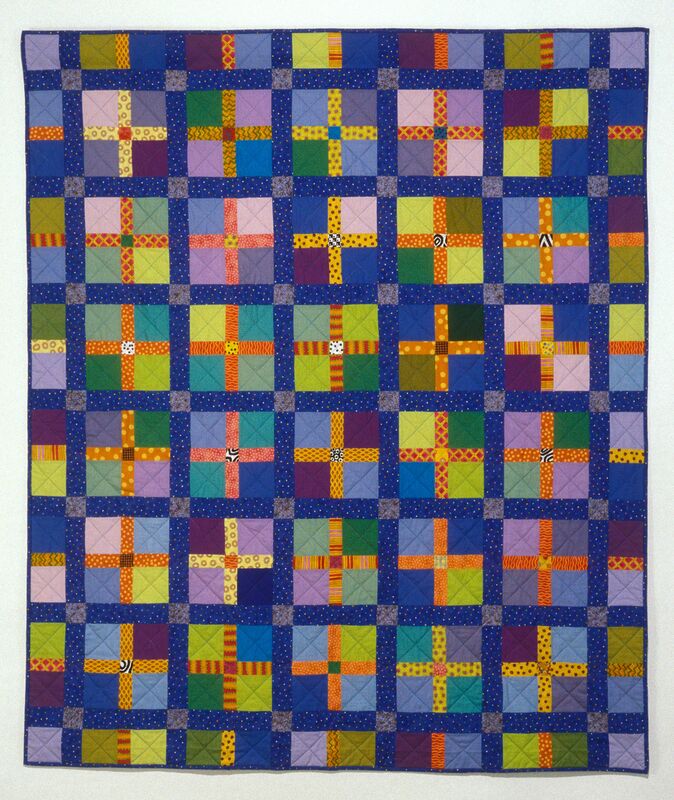 The following is the story I wrote about this quilt in June, 1991, almost 20 years ago. Wow, how time flies. But since I have labeled this blog as the repository for the histories of my work, I guess this story belongs here, too. It’s long, detailed, and full of all the fun facts that I thought were so extremely important at the time. And it harkens back to the times when I hand-quilted my work. I still know how to do this, but don’t use the skill too much these days. I’ve included these few photos to keep you interested along the way. In the spring of 1988 I found for $10 a brickwork vintage quilt top at Aardvark’s Odd Ark, a used clothing store on Telegraph Avenue in Berkeley. About the same time, I found a copy of Sara Nephew’s My Mother’s Quilts: Designs from the Thirties and began devouring it. I loved the designs, the descriptions of the women who made the quilts, and the copies of the old patterns from the newspapers in the 30’s. I had always wanted an old-fashioned quilt, but I couldn’t afford to purchase one. In addition, I had always wanted to do a purple quilt. Seeing the pattern for the French Bouquet quilt in this new book, I realized it was one that I could adapt to these scraps I had in the form of the brickwork quilt top. I thought that these pieces of fabric were the only old fabrics I could possibly find to be able to make my own 30’s quilt, so I began the time-consuming task. On our summer vacation in Pismo Beach and Carmel Valley in 1988, I took apart the whole quilt top, washed and ironed the rectangles, and discarded the ugly fabrics, saving all the 30’s fabrics that I liked. From those rectangles I cut diamonds, and saved the scraps, again thinking that these little pieces were the only old fabrics in the world. 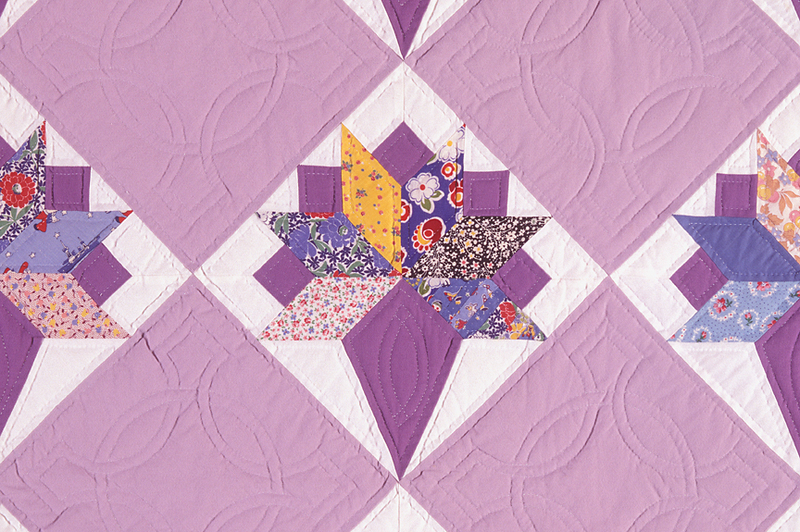 I chose the lavender and white for the remaining background of the quilt blocks and for the plain blocks, in order to be consistent with the usual colors of the time period. For the border I decided to use the sawtooth pattern, a pattern that I had always liked, since the quilt seemed to need a strong border, and the scraps saved from having cut the diamonds from the rectangles were just the right size for that border. I remember working on cutting the triangles for the border and pinning them together while I was pregnant and sitting on the floor at Head Over Heels, waiting for Patrick’s gymnastics class to finish. I found the quilting pattern for the plain blocks in Quiltmaker Magazine, SS/85. 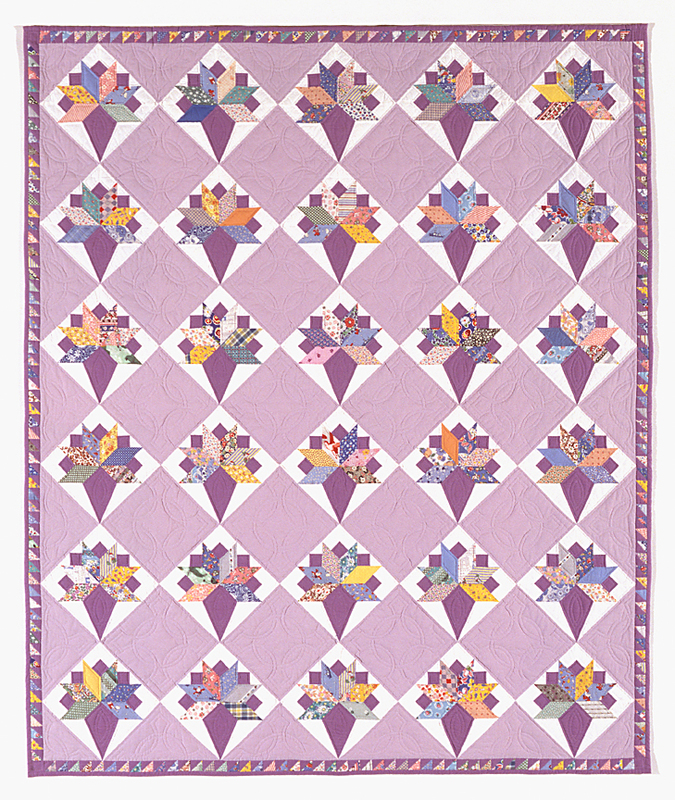 I finished hand-quilting the quilt and sewing the binding in July, 1989. 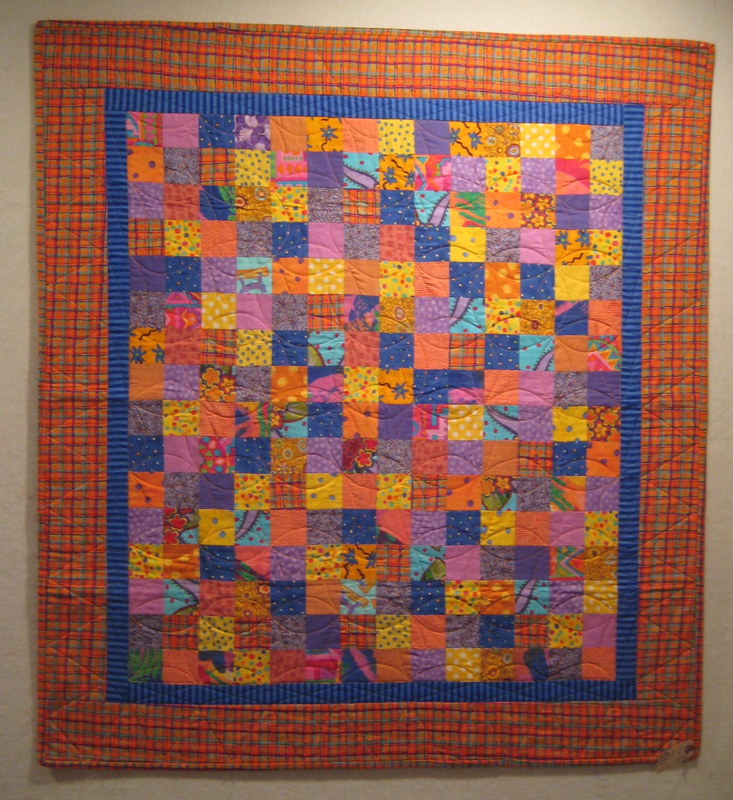 I love the quilt, and found a place for it to hang on the wall in the hall of our Montgomery Street home, so I could see it often, every time I walked up or down the stairs. 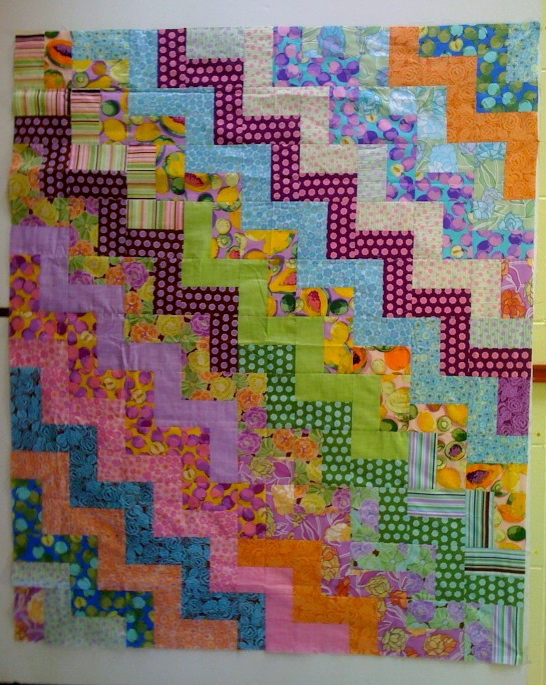 Using a Judy Hooworth quilt as inspiration (Razzle Dazzle Quilts is wonderful reading for me!! ), I took on the challenge of combining these dull solids with bright prints. For me, this was truly a challenge. Creating the blocks took me outside my usual comfort zone, and finding sashing and posts for the blocks proved to be the most challenging of all. I auditioned so many different fabrics for this quilt that I ended up making two small quilts from all the unused leftovers for the main quilt. Later, at a quilt show I was fortunate enough to present, Christina and her parents admired many of my quilts. I casually asked Christina if there were any quilts that were her favorites. 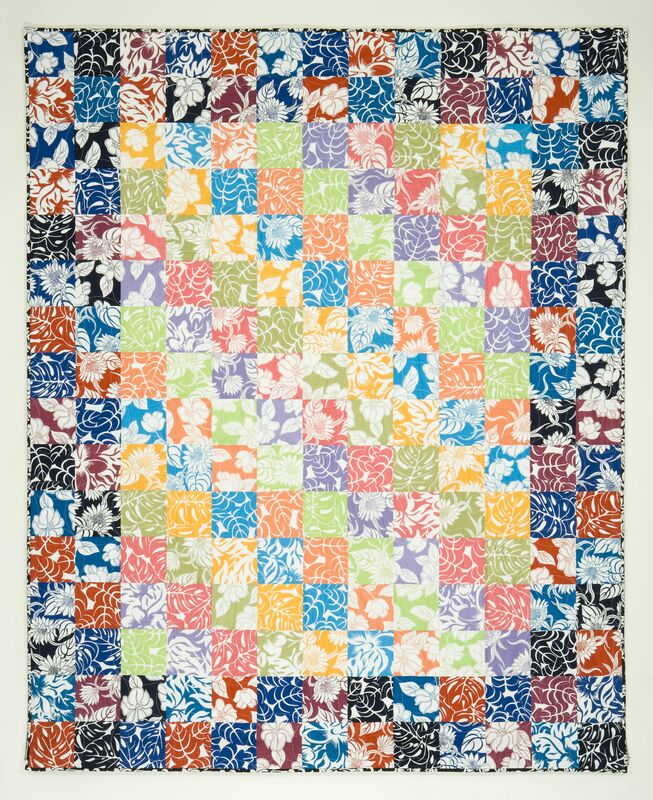 When she chose this quilt, she did not know that she was actually choosing the quilt that she would receive as a gift two years later. I hope it still appeals to her as much as it does to me. The first was made from the leftover solid blocks. And the second was the wide variety of fabrics that did not make the fit as posts for the sashing. I had originally thought that the posts for Four Square needed to be bright, but the final posts were a dull print, thereby allowing all the blocks to shine by themselves. The leftovers made this quilt. Hanging onto the scraps from finished projects has often been a problem for me. I work with them until I can no longer stand to look at them. Some artists might see this as “working in a series”; for me, it’s just puzzle-solving.